Thanks once more to my pal Shannon, we've got a R2-Series Astromech Droid Grey and Green (not R7-A7) - plus a bunch more as part of the second wave of figures. With this one there's a fine line between "proper configuration" and "I need one of each part," so you're seeing the "I need one of each part" configuration. How does Ahsoka's droid translate to realism via theme park? Read on! Guess what - next week your sneak preview figure goes up for sale in San Diego! It's today's Figure of the Day. Read about Stormtrooper (First Order) right now, or don't. It comes in a neat slipcase with a booklet hidden in the back. I've got many pictures for you if you read on! "Just different enough to make you mad." Well, not Jabba, Jabba's new and interesting. The rest of the set is as interesting as your collection isn't - it's great stuff if you don't got it yet. This set will be sold at the Entertainment Earth Booth at Comic-Con next week, on Toys R Us.com, and probably retail stores too. Want to see more images? Check after the jump. Two new ones today! 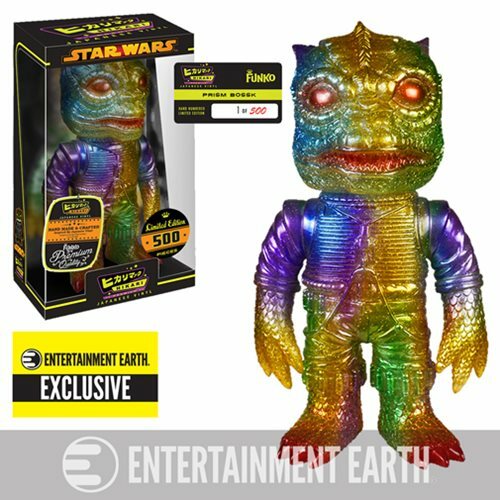 Prism Bossk (Entertainment Earth exclusive, limited to 500 pieces) and Starfield Stormtrooper (750 pieces) are up for grabs at your favorite stores. It's wordy, and only available on the Comic-Con International show floor. The Star Wars Darth Vader Hologram Limited Edition 20-Inch Action Figure has electronic lights in the box and is basically the same size as the projection on General Veers' AT-AT's dashboard. It will be $59.99 and limited to the show floor - no online sales are being made so if you want one, you're going to need to start driving to San Diego or bribing your friends who are going to the show. It will be sold at booth #2343 via Entertainment Earth. 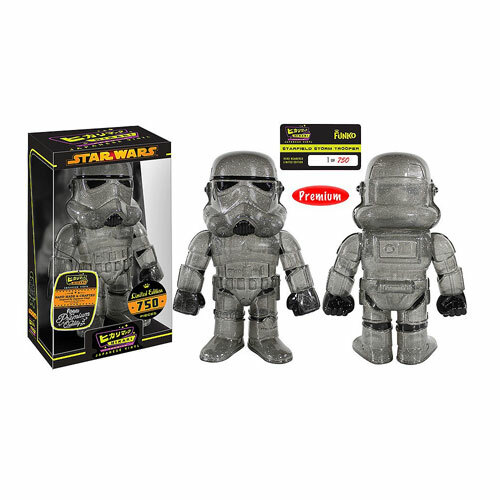 Ad: New at Entertainment Earth - Star Wars Hikar! Limited to 500 pieces, check out the Infrared Darth Vader - an Entertainment Earth exclusive. Also new and not an exclusive, K-3PO - which kicks off the C-3PO mold. Let's finish up this look at the first round of 2015 exclusives (more are coming in round 2) with the R2-Series Astromech Droid Blue and Yellow edition - this one is really close to the unreleased 2012 R8-B7! And he has a swell hat, assuming of course that's the hat you opted for when you built him at a Disney park this year. We switch gears tomorrow, so read on! The egg-like R2-Series Astromech Droid White and Yellow figure is today's release, and it ain't bad - we don't see a lot of white-domed figures. Read on! So now we're up to 25 of these in the 2015 series - but I'm still working through the first 11! Today it's the R8-Series Astromech Droid White and Blue version, and there's an orange one coming shortly. Amazing. Get one if you dare, and read on! Today in Figure of the Day: R6-Series Astromech Droid White, Black, and Red! If you missed the news, R6 droids will appear in the new movie - so that's a good reason to get one like this. Read on! Today: R5-Series Astromech Droid Red and Black! It's like R5-K6, which is really expensive on eBay from the Scramble on Yavin set, but this is.... less expensive. If you're at a Disney Park, at least. Read on! Today in Figure of the Day: R2-Series Astromech Droid Silver and Blue MK II! It's a lot like the last R2-D2, but not - other than the dome, each piece has slightly different tooling and a lot of deco tweaks. It's for completists only, but at this point that's a lot of us. Read on! Today we look at the Disney R2-Series Astromech Droid Black and Gold (not Goldie R3-S6), which is pretty close to the Separatist droid from the TV show. It's black, it's gold, and it even has some silver in spots. It's arguably worth the trip to get this one, or if you're me, it's worth pestering friends to help you out until it shows up in the mail. Read on! One of at least a few droids to be redone in the Droid Factory, this R4-Series Astromech Droid Blue (MK II) is actually fairly different - it's not just a slightly different shade of blue, but the paint masks on the dome are different, too. Even though at first glance it looks the same, it's not - you can see some pretty striking differences when you click here to read on.